The sgBikerBoy 2016 Trip – Day 12. Breakdown in Pai. The room in Pai didn’t come with breakfast. So I went searching for some food in the morning. 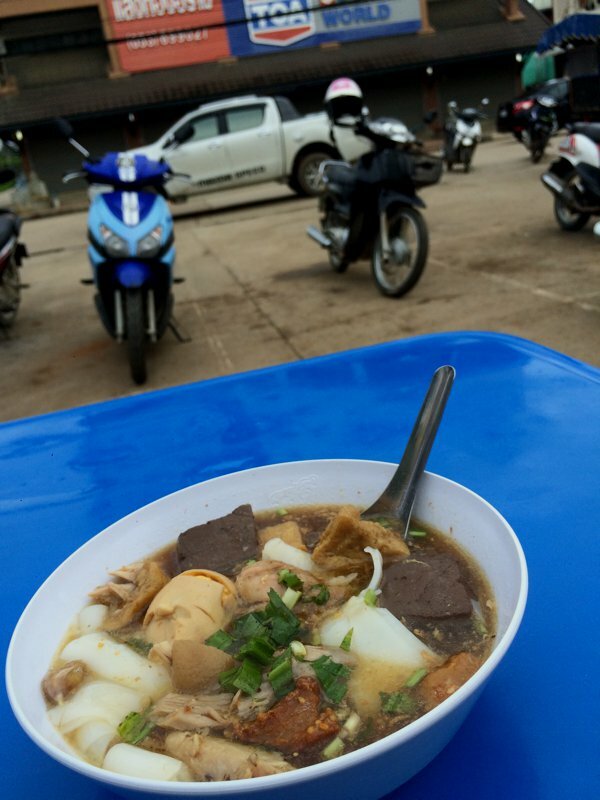 Came across a roadside hawker center and tried ordering some “Chinese Roll Noodles Soup”. Chinese Roll Noodles Soup. Quite good actually! See those brown cubes there? They’re pig’s blood – made into a tofu-like texture. I used to eat them when I was younger, but you cannot quite find it in Singapore these days. I later found out that “Chinese roll noodles” refers to chee cheong fun – quite commonly available in Singapore and in Hong Kong (where it’s known as “cheong fun”). Since I arrived in Pai rather late last evening, and that it was raining the whole of last evening, I didn’t quite get to see Pai. And after breakfast, I decided to stay for another night. And so, I quickly confirmed it with the accommodation reception (who happened to be a Chinese student from Beijing, here in Thailand working for food and accommodation with no pay), and paid for the next night. I went exploring Pai. As I was riding aimlessly, and exploring the area, the bike started to feel strange. There was a sudden loss of power and the engine sounded like it was choking – not too indifferent from what I experienced a couple of days ago, but only worse this time. And then it died. It just died. The starter button worked the starter motor, and I could hear the engine crank. But it just wouldn’t turn over and start. Air – fuel – spark. The 3 components necessary for the engine to work. My air filter should be good – I personally replaced it just a day before the trip and haven’t really done any off-roading. I’ve got a full tank of fuel and the last person to remove the fuel tank was myself, and I was absolutely confident that I’ve put it back properly. 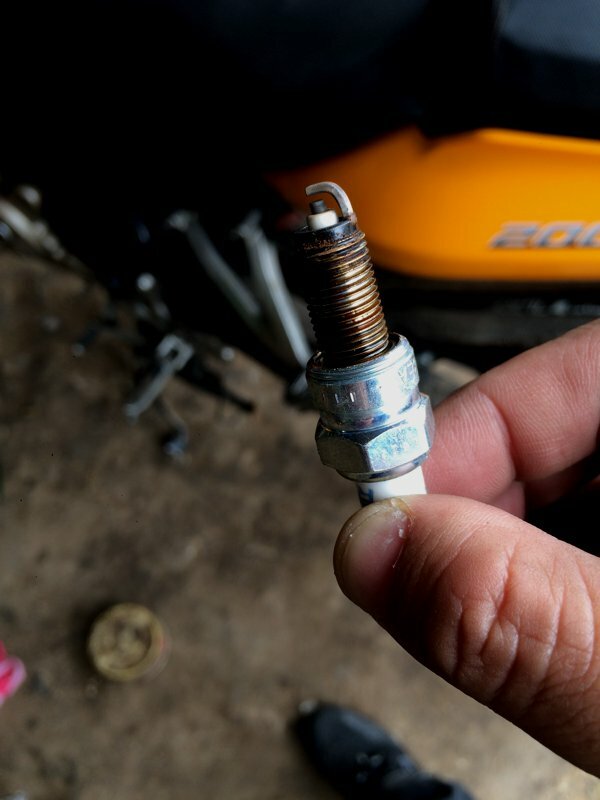 Spark – the last spark plug replacement was barely 5,000km ago. But I was praying real hard that it was the plugs – I had spares (in the hotel room, though). About 5km away from the town of Pai, I initially tried to, but later gave up pushing the bike back to town. My mind was racing as to what I should do. Am I gonna be stranded? Stranded in Pai? Stranded in Thailand? Stranded some 3,000km away from home? And so I flagged down a random car and sought help, and a male local who looked like he was in his early 30’s stopped. After some gesturing, he understood that my bike is dead and I needed help to get back into town. So he signalled me to hop on board and ferried me back to Pai. Barely a minute into the journey, he turned up the volume of his car’s stereo and started whipping his head around to the beat of the music. And then, he pulled out an opened can of beer and started drinking! Having my bike break down was bad enough. Being stranded is unnerving but still manageable. But now I’m stuck in a car of a drunk punk?!? He offered me an unopened can, but I politely declined. In my head, I was praying real hard that I’ll get to Pai alive. Please, please! Let me live. It’s only 5km away! No, my GPS tells me that by now, I’m merely 3km away from town. And so I tried to distract him from his drink and started a conversation. We spoke about the made-in-Thailand cars and how the Japanese have moved their factories to Thailand. He then showed me the 2WD / 4WD control knob on his SUV and (from what I could understand) how powerful the car was. And out of the blue, he suddenly swerved intentionally into the path of a car coming from the opposite direction and then back again into his side of the road and seem to be telling me how great the steering stability is on this car. Thankfully, before long, we made it into town – and in one piece. Phew! And then my troubles began. Frustrated, the drunk punk gestured to me to walk away, and we went to the next bike repair shop just behind the first shop. And after the drunk punk (whom I’m now beginning to like) explained the situation to the bike shop owner, the owner started speaking to me in Mandarin (Chinese). A Chinese Thai!! OMG! Thank you! I can now understand and be understood! And so the drunk punk realised that both the shop owner and myself could converse in Mandarin, he made his leave. I thanked him profusely and was grateful for his assistance so far (except for the drink driving and car swerving part.) After explaining my situation to the bike shop owner, he told me that he doesn’t work on “big bikes” and he only deals with small bikes – the 100cc or so scooters. And so, he directed me to seek help from the *other* bike shop behind his. Sensing my helplessness, he told me that the most he could do is to get someone to ferry the bike back to town. He doesn’t work on “big bikes”. Of course, I was grateful for that offer. In Singapore, a 200cc single cylinder machine would be considered “small”. Here, it’s a “big bike”. It’s all relativity, I suppose. The downed Bajaj Pulsar 200NS on a songthaew. 300THB for the trip. And now that the bike is back in town, the 2nd shop owner reiterated that he doesn’t work on “big bikes”, and referred me to the 1st shop. Reluctantly, I pushed my bike to the 1st shop for the grumpy owner to take a look. Grumpy owner of 1st shop looking at my bike. I was hoping that it was the spark plugs. Pulled one out to check its condition. Maybe the carburettor and gasohol combination was running lean? Spark plug was replaced about 5,000km ago. Nope! Still looked relatively good. 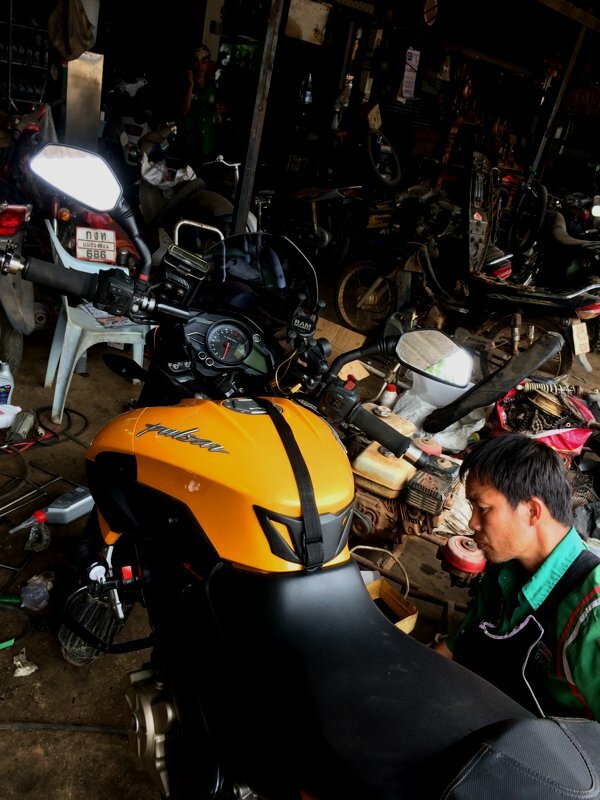 After a quick look, in his limited English and with a heavy dose of Thai, he seem to be telling me that he cannot work on the bike and its likely a piston or valve timing issue. He told me that he has “a lot of other bikes to work on” and suggested that I went to the 2nd shop. Oh great! Now the 2 shops are pushing me to each other. So I went back to the 2nd shop – at least the owner could speak a language we mutually understood. He took a quick look, reiterated that he doesn’t work on “big bikes” and kinda said something about engine / piston failure. Oh great! 2 independent mechanics suggesting engine failure. 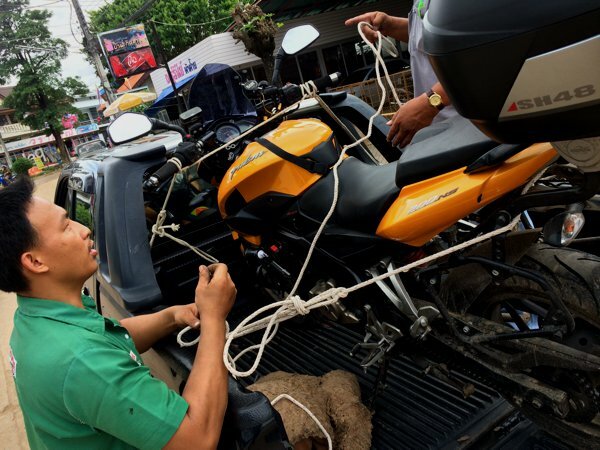 He suggested that I brought it to Chiang Mai to get it repaired – if I knew where the dealer or agent was. Chiang Mai is some 3’ish hours away from Pai and is the nearest city. So if there’s any chance of getting my bike running again, it’s got to be Chiang Mai. The 2nd shop – the “small bike” workshop. Thailand doesn’t have a Bajaj dealership. Not even parallel imports. Oh dear. 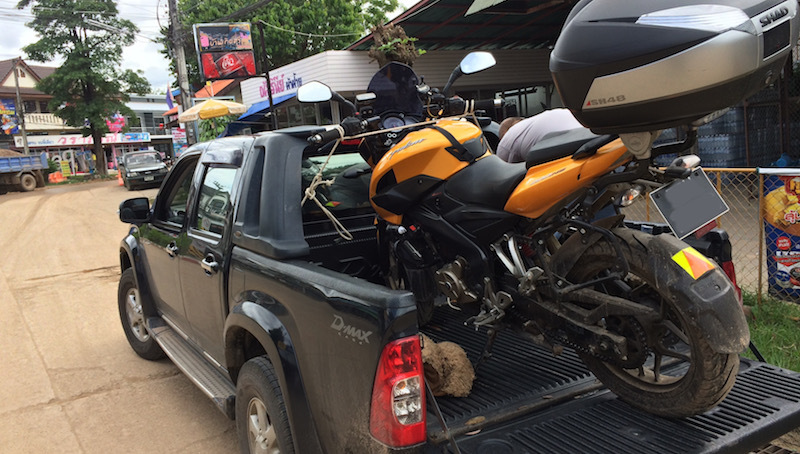 Then the 2nd shop owner suggested I leave the bike there, go for lunch, find out where the dealership in Chiang Mai was, and the best that he could offer was to help me arrange for the bike to be transported to Chiang Mai. 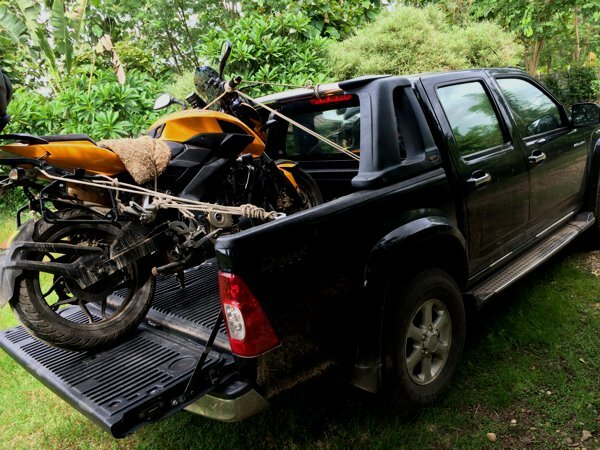 But transporting the bike there is gonna cost me between 2,500 to 3,000 THB. So over lunch, I recalled someone on GT-Rider recommending a shop in Chiang Mai where the farangs go to with their big bikes. The Piston Shop. The owner, Nat spoke excellent english. So I googled them up and called Nat, and told him about my situation. Over the phone, he told me that he was willing to take a look at the bike, although he wasn’t confident of getting the parts. 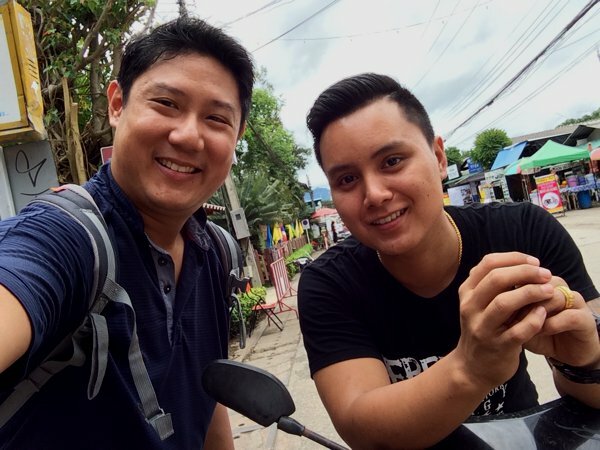 I told him that I should be able to source the parts from Singapore if necessary, but I just needed someone who is willing to take a look – the 2 only shops here in Pai weren’t willing to. But now I needed money. I was running low on THB, but still had some healthy amount of USD with me. I had tried buying some THB in the morning, and although it’s a Friday, it happened to be a bank holiday and all the banks are closed. Oh great! And so I asked the owner of the restaurant where I could get some money changed, and they directed me to the Walking Street in Pai. The really nice restaurant owner who ferried me to the money exchange, and waited 20mins with me at the exchange. The Thai are such nice people! So with sufficient Thai baht in hand, I went back to the 2nd bike shop and requested his help to arrange for the trip to Chiang Mai. 2nd shop owner helping out to secure the Pulsar to the truck. The Pulsar 200NS loaded onto a truck as I scrambled back to my accommodation room to pack my belongings. It was 3’ish when we left Pai. And the journey will take some 3 hours or so. I called up the Piston Shop in Chiang Mai, and the owner, Nat, told me that he normally closes at 6, but will wait for me until 6:30pm. We were cutting it really close. The truck driver spoke to Nat on my mobile to ask for directions and understood the deadline. The Pulsar taking a back-backseat. 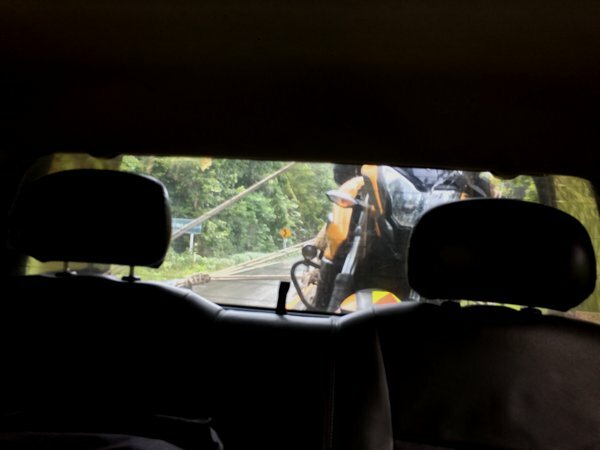 After days of riding the Mae Hong Son loop, it felt surreal and so different doing the final leg in a 4-wheeler. The route from Pai to Chiang Mai was similarly mountainous and windy. But at every bend, instead of leaning into the bend as I’ve gotten so used to by now, I was actually leaning AWAY from the bend due to centrifugal force. So different. So different. We reached the fringe of the city of Chiang Mai at approximately 6pm. But we still needed to make our way to the shop. The truck driver was quite literally making a mad dash for the shop as he weaved through (admittedly quite crazily) the evening peak traffic. I called up Nat to confirm that we were super near. Just stuck in traffic. He promised to wait till 6:30pm. We finally arrived! 6:25pm on my watch. Phew! 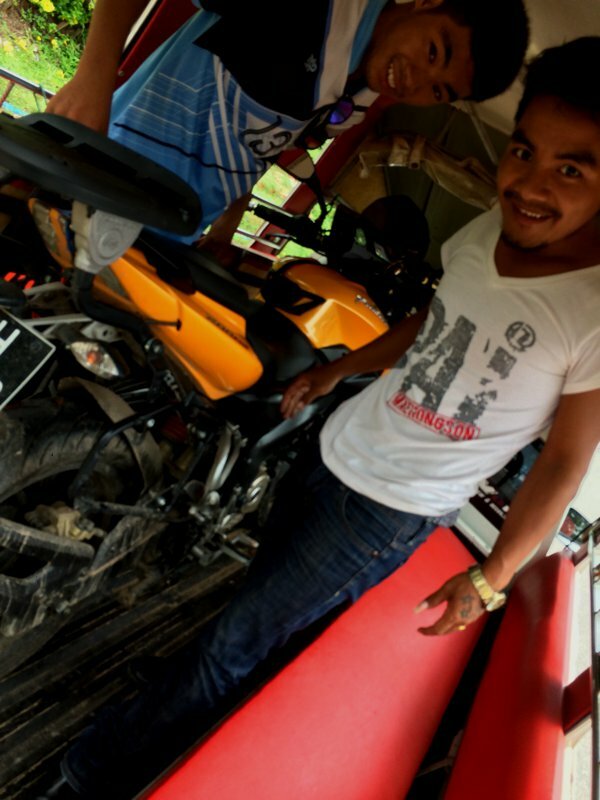 Unloaded the bike, paid the driver 2,700THB (2,500THB for the “taxi” rental and 200THB for gas), and handed the bike to Nat and his workers. He tried cranking the bike, and it still wouldn’t start. Took a quick look and listened to the sound of the engine while cranking. He suspects an engine issue. Not electrical. Nat’s the third mechanic to tell me an engine failure. Oh no. Not good. Left the bike at the shop and lugged my 85L duffle to a nearby hotel. At least I managed to get to Chiang Mai. I needed something sweet at the end of the day. 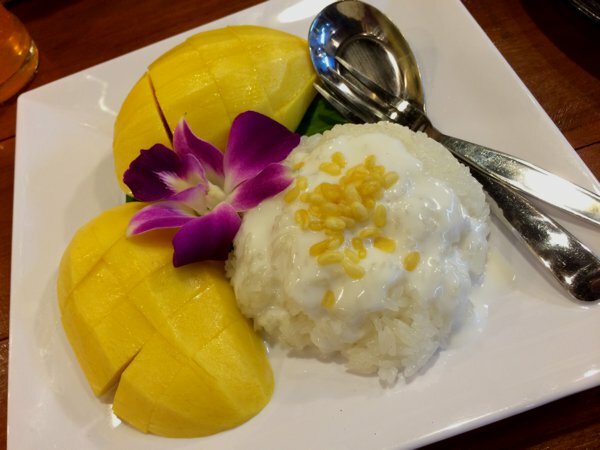 The mango with sticky rice (kao niu mae muang) was really good. We’ll see what happens tomorrow, Saturday. Oh no. This just have to happen so near a weekend. Bummer. Sorry to hear about your problems. If only I had discovered your blog earlier, I could have offer some suggestions. Unfortunately you’ve already left Pai and seem to be in CNX. I visit CNX about 2x a year. Don’t know where you’re staying but Varada place is great and I always stay there. Rate is about THB700-800/night for a room but she also has 4 bed dorm style bunk for THB200/night (share room with maybe 3 others). Anyway cheers to you for riding all the way up from Sin. North Thailand is fabulous riding country and certainly hope you fix your bike and can continue riding. Email me for more advice on CNX, Pai and N Thailand. Hi Richard! Thanks for dropping by and for the tips! You see, when the bike was down and I desperately needed help, my only resource then was gt-rider.com. 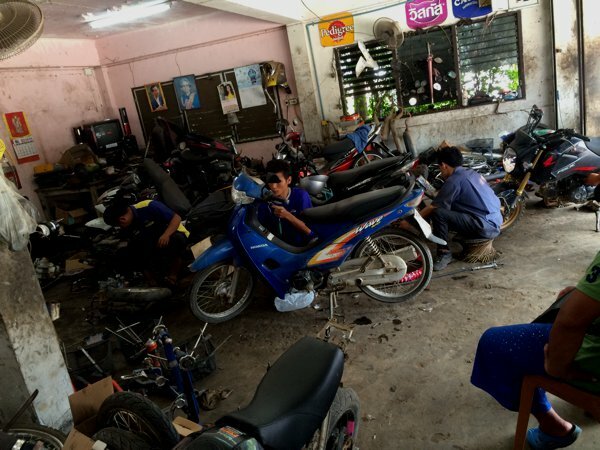 The folks in the forum compiled a great list of bike shops that the farangs use, and Piston Shop in CNX came highly recommended. So, with my limited information (and time), and at the suggestion of the small-bike mechanic there, I decided to just tow it to the nearest big city. Anyway luv to blanja you makan soon, you’re another Singapore Olympic Gold Champion. I live at Upp Serangoon near NEX and work shifts. This Sun I’m off and we should have kopi and share. I’m with a bunch of old farts who ride regularly and would luv to welcome you to our gang. Perhaps can either join us for our next ride to N. Thailand or my annual ride to Phuket, both next year. Haha! There’s no way I can compare to Schooling! He’s an amazing and truly inspirational character. Anyway, I’m now in KL – yes, not in Singapore, again. Offer for makan and kopi on anytime. Wanna cycle with my and othet 50++ year old for overnight cycle from Pengarang to Kota Tinggi this 27 +28 Aug w/e? Totally different view from cyclist point! Hahah. I’m not quite an athletic person and it’s very evident around my waistline. So I’m not sure if I can reach Pengarang if I do actually cycle! Lol! Sounds like a fun plan! Have fun there, yah! The seafood there’s great! Hi Richard. Are you the one I am going to meet for Kopi this coming Tuesday morning 6th June? Raymond here. Friend of MG. I will be doing a trip in dec to SG-Hatyai-Koh Samui-Phuket-Krabi-Penang-Malacca-SG. Great to know it’s helped you. You should also check out my SG to Thailand notes, if you haven’t already. All the best to your trip! Hi Jos. Are u doing any trip this year 2017? Spoke to Derrick today and we 3 should meetup soon to help you plan your trip. See you Tues morning. Derrick, free this Tue 6 June for morning kopi with Raymond? Unfortunately, I won’t be available in the morning. Evening, perhaps? Next Next post: The sgBikerBoy 2016 Trip – Day 13. Bad news. ← The sgBikerBoy 2016 Trip – Day 9 to 11 ← The sgBikerBoy 2016 Trip – Day 13. Bad news.